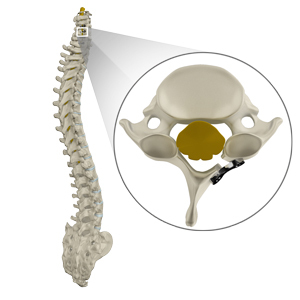 The objective of cervical laminoplasty is to relieve pressure on the spinal nerves by removing the source of pressure without disturbing the stability of the posterior elements of the vertebrae. This procedure is also called an "open door laminoplasty," because it involves "hinging" one side of the vertebrae and cutting the other side forming a "door", which is opened and placed with wedges made up of bone and instrumentation. Your surgeon recommends you for cervical laminoplasty after examining your spine, medical history, and imaging results of cervical vertebrae such as X-ray, CT (computed tomography) scan or MRI (magnetic resonance imaging). Surgery is recommended only after non-surgical treatment approaches fail to relieve symptoms after a reasonable period. The procedure is performed with you resting on your stomach and injected with sleep inducing medication (general anesthesia). Your surgeon makes a small incision near the center of your neck on the back side, and approaches the neck bones (cervical vertebrae) by moving the soft tissues and muscles apart. The spinal processes of the vertebra are removed. Then, a side of the cervical vertebra is cut making a "hinge" and later the other side is also cut allowing the bones to open like a "door". The back of each vertebra is bent back to remove pressure on the spinal structures such as spinal cord and spinal nerves. Other compression sources such as bone spurs, excess ligaments and/or disc fragments (discectomy) are also removed. Small wedges are placed in the "open" space of the door and sealed with proper instrumentation. After the procedure, your surgeon brings back the soft tissues and muscles to their normal place and closes the incision. A specific post-operative recovery/exercise plan will be given by your physician to help you return to normal activity at the earliest. After surgery, your symptoms may improve immediately or gradually over the course of time. The duration of hospital stay depends on this treatment plan. In a few instances, surgery may also be performed on an outpatient basis. You will be able to wake up and walk by the end of the first day after the surgery. Your return to work will depend on your body's healing status and the type of work/activity that you plan to resume. Discuss with your spinal surgeon and follow his instructions for optimized healing and appropriate recovery after the procedure. Please take your physician's advice for a complete list of indications, clinical results, adverse effects, warnings and precautions, and other relevant medical information about cervical laminoplasty procedure.